A friend went to Peru and Costa Rica, and asked me what I wanted as a souvenir. I’m sure she was expecting me to ask for a sweater or something like that, but I think I surprised her. Food, I replied. Something unique. Maybe a sample of the tea you’re supposed to take when you’re climbing Machu Picchu? What she ended up bringing back was some Lizano salsa, (Lizano sauce). The taste of Lizano is a little hard to explain. A sauce made out of vegetables and salt, it tastes a little like a slightly sweet and spiced V8-flavoured sauce, minus the tomatoes. Stick it on tacos, she said, when I asked what it was normally used it for. That seemed kind of a waste though. 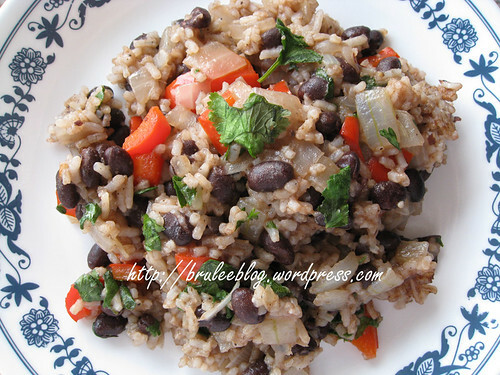 and then I found a recipe for a Costa Rican gallo pinto – beans and rice. Now you can apparently substitute Lizano sauce with Worcestershire sauce, but they just do not taste the same. I tried called a couple of places to see if i could find it here in Edmonton, but with no luck so far. Paraiso Tropical said they have carry the same kind of sauce but from a different brand. The person who answered the phone at El Rancho Latin Market told me they didn’t speak English and hung up on me. Anyone know if I can find this stuff here in town? If the other brand doesn’t taste right I’m going to have to resort to ordering the sauce online. Pour the oil into a large skillet or wok set on medium heat. Add the onion and cook until the onion starts to turn translucent. Add the red pepper and cook until the red pepper is soft. Add the garlic and cook for about a minute. Add the can of beans to the pan, but only add a little of the liquid in the can (reserve the rest of the liquid just in case). Add the Lizano or Worcestershire sauce, stir and let everything cook for about 3 minutes. If the pan starts to dry out, add more of the reserved bean liquid. Season with salt and pepper. Add the rice, and stir until well coated, and cook until the rice is heated through. Top with chopped cilantro, and add additional salt, pepper, or Lizano sauce if necessary. 2nd Update: I keep getting internet stores advertising in my comments, so I am closing comments on this post. Google it if you want to order Lizano online. 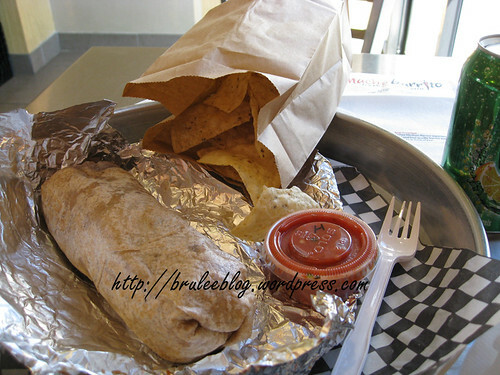 Mucho Burrito is a somewhat new and expanding franchise chain in Alberta. In the past year it seems like there have been Mucho Burrito locations popping up all over Edmonton. The food is relatively basic – burritos are the main feature – and you get to layer on whatever you’d like, kind of like ordering a sub at Subway. My regular choice is generally a carnitas burrito (pork) on a whole wheat tortilla. A small will fill you up. A medium will do if you’re starving. The large size will practically feed 4 people. I ordered a combo which means a drink and a choice of either tortilla chips and salsa, a cookie, or some cinnamon thing that I’ve never bothered to try. The tortilla chips are crispy and not greasy; always a winner in my books. Warning – the hot salsa is “burn your mouth” type of heat. You may want to start off with mild or medium if this is your first visit. 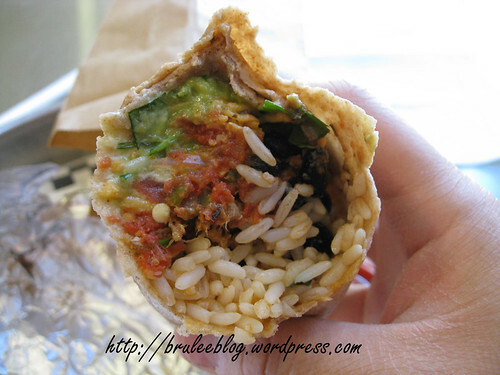 For fillings, you get rice, your meat (unless you ordered the vegetarian burrito), guacamole (extra charge), salsa, and your choice of veggies, black beans or brown beans. Then the whole thing is rolled and briefly grilled on a press. Pardon the bite marks and dry hands in the photo. Oh, and if you really want to torture yourself, there are handy bottles of Tabasco sauce over by the straws and napkins for your use. Various locations in Ontario, Alberta and Saskatchewan; new franchise purchased for Vancouver, B.C. A few years ago I did some research using my friend the Internet, looking for a fresh summer recipe. The one I used that day, and used many times since, surprised me because it was a recipe by Rachael Ray. Now, I have never particularly liked watching Rachael Ray. Nothing really against her food but I find her way of speaking to be quite irritating. If the use of “evoo” and “yum-o” ever died I would be okay with that. This dish is really tasty though, so if you don’t like Ray, don’t avoid this recipe just because of where it came from. And if you’re a fan of hers, if you haven’t tried this one yet I highly recommend it. It is a convenient dish that has relatively few ingredients – and even better usually ingredients that I have on hand at all times. Combine all of the ingredients into a bowl. 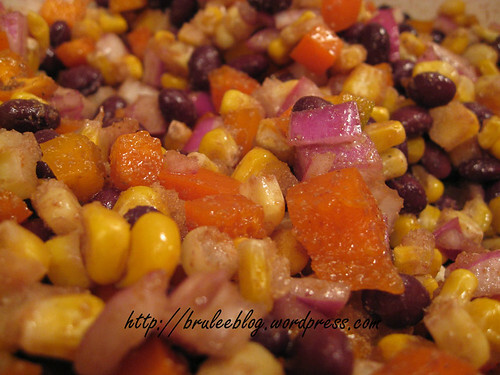 Let the salad sit while the frozen corn defrosts, then stir again before serving. This is a great recipe to take to a bbq or party as the corn will keep your salad chilled as it defrosts.